Well, I got good news and I got bad news. Mostly I have a little good news, that’s not really good and a bunch of bad news, that’s not as terrible as it could be. 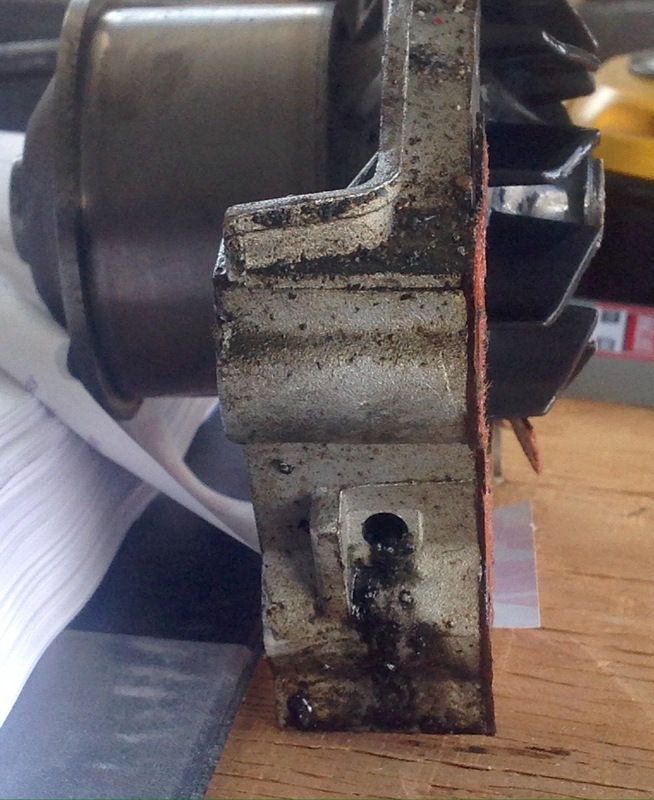 This somewhat grimy piece of my engine is a side view of the waterpump. It’s no longer in my car, but you probably figured that part out already. But, this really is a good news picture. Tuesday, when I talked about the various things that could make my engine temperature spike, I pretty much narrowed it down to two: the waterpump or the thermostat. But, there was a third option. An absurdly simple option that I’m embarrassed to say I didn’t even consider. It might have just been low on fluid. Of course, it could just have been low on fluid. I didn’t say much. I thought about the money I’d already spent on parts. I thought about how much work I had put into disassembling my car. I thought about the fact that there was really no way to check at this point. And then, I drained the fluid out of the radiator. When we installed a new radiator last year, I put a couple of gallons of anti-freeze into the system. Yesterday when I drained the fluid there was about 3 quarts that came out. Oh, that’s not good. The car is at an odd angle and the radiator actually tilts away from the drain plug. (Called a petcock or p-valve.) As I watched not nearly enough green antifreeze drain out of my radiator I went over again, the symptoms of my latest car mishap. Plenty of antifreeze in the overflow reservoir. Of course, it could have sucked it back in rather than blow the engine. It was boiling after all. No heat at idle, but heat when we got moving. Could be not enough antifreeze to circulate without the forward motion. There was way too good of a possibility that my problem may have been simply cured with an $8 gallons of antifreeze from WalMart. I didn’t say anything to my neighbor. It was bad enough I was potentially wasting my time, I didn’t need the neighbor-guilt as well. Yesterday afternoon we finally got the last of the disassembly done and pulled off the old waterpump. A lot more fluid drained out. And as we surveyed the old pump we noticed that little hole at the bottom of the pump in the picture. That’s a weep hole. Remember that pool of antifreeze I didn’t see under my car? 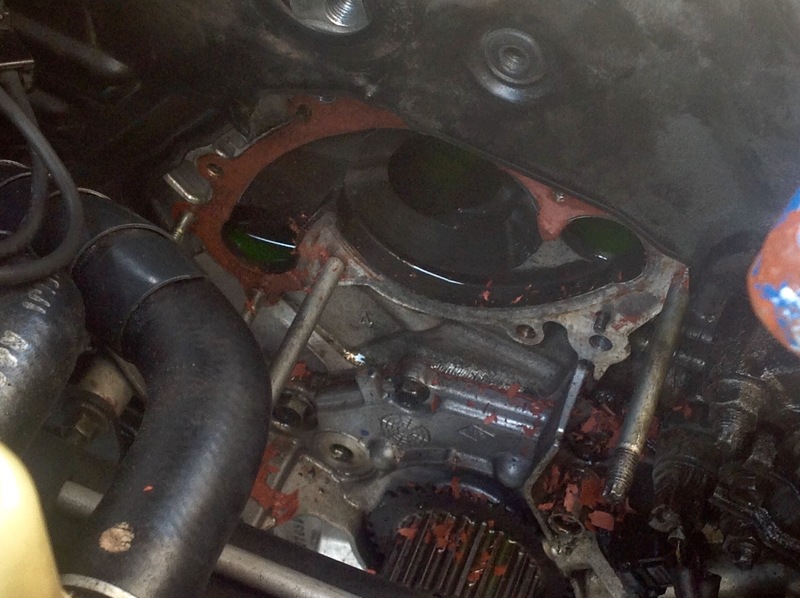 The purpose of the weep hole is to drain antifreeze when the waterpump fails. That black grimy discharge indicates that the waterpump was doing just that. A good waterpump will never weep like that. At least I knew that all my work wasn’t for naught. My waterpump really was needing to be replaced. Not so much good news, as a lack of bad or worse news. The waterpump, naturally is sealed to the engine. It has boiling hot antifreeze running through it under pressure. It has a gasket. You replace the gasket when you replace the pump. The gasket is really good at sticking. Not so good at coming unstuck. This is what the spot where the waterpump goes looked like after about 45 minutes of very carefully using a razor blade to scrape off the gasket. The problem with this step is that you have to scrape off the gasket with a steel blade while not scratching the aluminum block. And while the picture looks pretty clear, the actual clearance means that at times I was holding the razor blade by two fingers while pushing with my thumb. I think that’s why the gasket is red. The blood doesn’t show. The last of the bad news was that once again the cold chased us from the driveway. Car repairs can be broken into roughly three categories. There’s a step 2.5 – Fix the Problem. But, it’s such a minor thing in the grand scheme of things that it almost seems like an afterthought. Yesterday we made it through step 2. Today, the goal is to take one more vacation day at work and finish putting it back together. . .after we dissassemble enough to replace the thermostat as well. After all, just because I know the waterpump is bad doesn’t mean the thermostat doesn’t also need to be replaced.